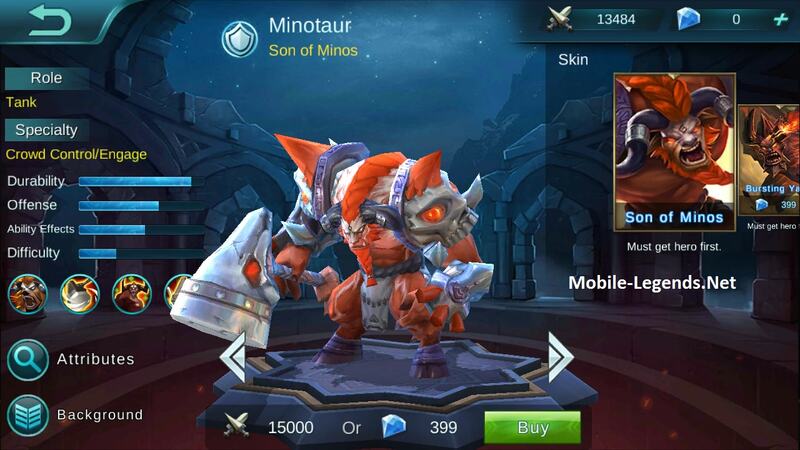 Minotaur, Son of Minos. I like this champ, hero is tanky and has a very powerful crowd control skills. 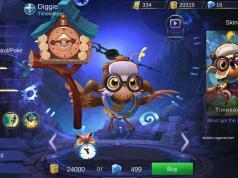 Also hero’s price is 15k battle points. 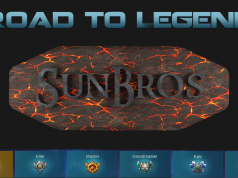 If your team need a tank, Minotaur is a very good choise. You can search for Minotaur builds in mobile-legends. Passive: Rage Mode, When abilities or basic attacks hit enemies, Minotaur will become more enraged. 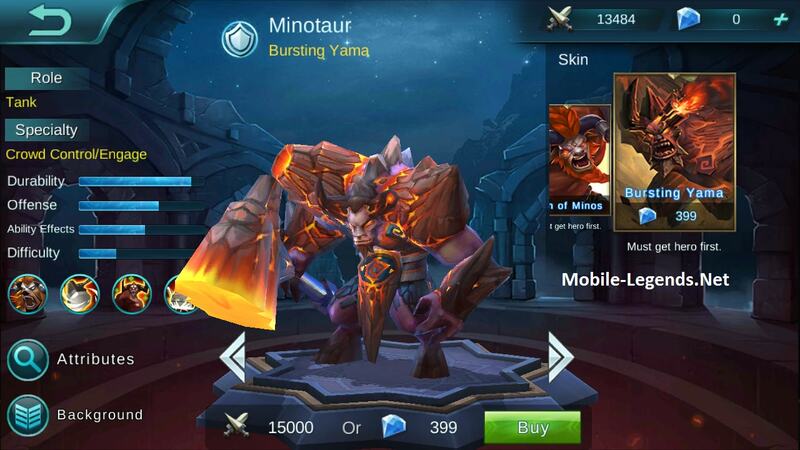 When Rage is full Minotaur will enter Rage mode and receive extra armor and magic resist (effects increase with level), as well as extra effects for his abilities. When Rage Mode subsides, Minotaur will be unable to build up Rage for a time. Skill 1: Despair Hammer, Wields a Warhammer and deals 330 physical damage to enemies within melee range in front of him, also lowering their movement speed 65%. If in Rage Mode, attack range will expand greatly. Skill 2: Motivation Roar, Encourages himself and surrounding allies, regening 340 HP for himself and givin allies 50% healing. If in Rage Mode, a Rage Regen effect will be activated for 2, allowing him to regen HP after taking damage. Ulti: Minoan Fury, Strikes the ground 3 times in a row, causing shock waves that deal 360 physical damage to nearby enemies as well as 180 true damage. Also lowers target movement speed 50%. If in Rage Mode, his striking speed will increase, he will deal an extra attack, and enemies will be knocked airborne. 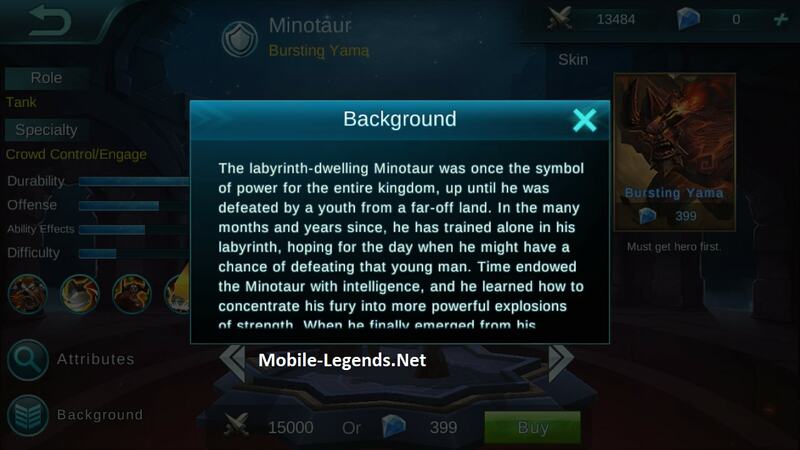 The labyrinth-dwelling Minotaur was once the symbol of power for the entire kingdom, up until he was defeated by a youth from a far-off land. In the many months and years since, he has trained alone in his labyrinth, hoğing for the day when he might have a chance of degeating that young man. Time endowed the Minotaur with intelligence, and he learned how to concentrate his fury into more powerful explosions of strength. When he finally emerged from his labyrinth, he discovered that the thriving Minoan civilization had long ceased to be, and that the whole world had moved on. As he sat lamenting the absence of a proper outlet to show off his powers, a voice from a distant alternate dimension summoned him. This is how the Minotaur came to the Land of Dawn, where he can fully unleash his powers and restore his name as a Son of Minos.